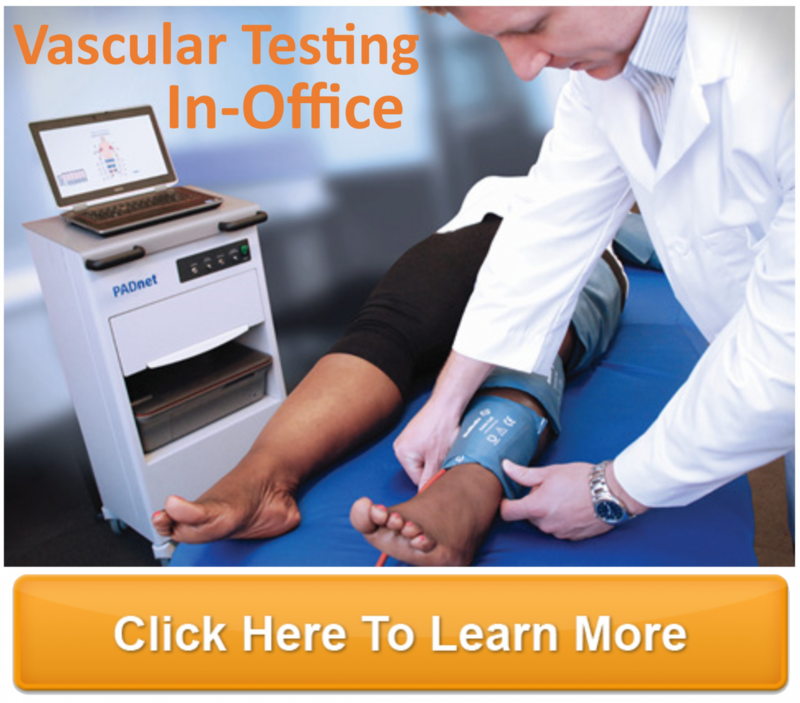 At the Advanced Footcare Clinic, we are committed to your health. We treat your feet, but we realize that your foot health affects your overall health, and your overall health affects your feet! 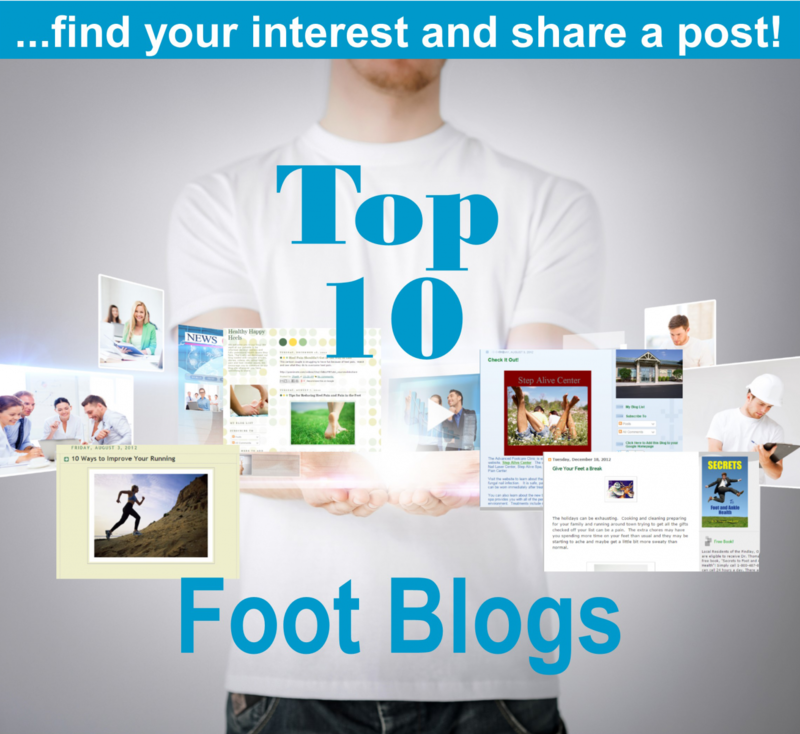 We know that your feet are the foundation of your body, and when they are in pain you cannot exercise for your health. That is why we are committed to educating our patients on their foot health and their over-all health. Since we are so committed to your health, we wanted to bring you our 8 Week Run-Training Program to help you get back into shape and exercise for your health. A 30 minute run 3-4 days a week is enough to help you lose or maintain your weight and improve many other important health markers, like cholesterol, blood pressure and insulin response. And most people can find time for a 30 minute run in their schedules. It is a great way to start your day- waking your body up fully and getting your blood flowing for your long day of tasks. But many people are not in good enough shape to run for a full 30 minutes. We can help! Here is an eight week program designed to gradually build your endurance, stamina, and cardiac conditioning so that you can eventually jog for 30 minutes straight. It is designed to have you exercise for 30 minutes a day, with a combination of walking and jogging repetitions until you can jog for the entire half hour. For example, Wednesday of Week 2 has you doing 7 repetitions (or cycles) of running 3 minutes, then walking for 1 minute. After you have done this seven times, you will jog for a final 2 minutes for a total workout of 30 minutes. If you are over 40, are inactive, are more than 20lbs overweight, have diabetes and/or have any kind of heart condition or other concerns, please consult your doctor before beginning any kind of exercise regimen or diet program. They will most likely encourage you to start such a program, but you will want their advice and approval. Also, you may not feel you are in good enough shape to even begin jogging at all. 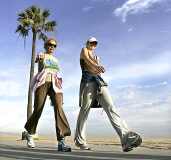 We suggest that you walk daily for 30 minutes to an hour and regulate your diet carefully. With a little work, you can lose some weight, and get to a fitness level where you feel comfortable with some light jogging, and eventually you can work up to a 30 minute run! This program is designed to start your work outs very slowly, with an emphasis on walking and not running. This means you can begin this program no matter your fitness level. You should expect some set backs however. Having a bad day does not mean that you should give up though, as they are often followed by some of the best days you will have while working out. Remember not to rush either. This program is designed to slowly build up your fitness level. You will get to your goal in time, just keep reminding yourself of your goal and the progress you have already made. When walking is scheduled in your work out, remember that there is a right way to walk. You need to get your heart rate elevated. The rule of thumb for a good walking speed is that you should be able to hold a conversation, but you should be a little out of breath. Don't forget to pump your arms- bringing your upper body into the workout helps raise your fitness level, burn calories, and encourages your legs to work harder. Good jogging form is important for your workout. Your arms should form a 90 degree angle and rest at your side. Swing your arms at the shoulder, and always do what feels natural to you. Do not force your arm swing. You should make loose fists with your hands, there is no need to clench, and no need to make "blades" with your hands. Remember to pace yourself, you are just learning to jog and get into shape. You should expect possible side stitches and to be a little out of breath. Pay attention to these cues from your body to help you determine your pace. Jogging is a low-speed activity, so do not sprint and pay attention to your breathing and other bodily cues to help you determine your pace. 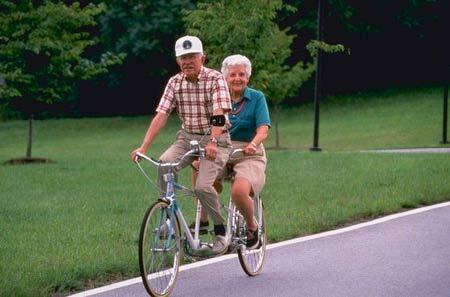 As you learn to exercise for longer, you can eventually also learn to pick up your pace. This comes with time. Finding a workout partner increases your chances of success. Having someone else to keep you motivated and accountable will really help you stick with the plan. It also gives you the chance to build your friendship or relationship. Your shoes matter! 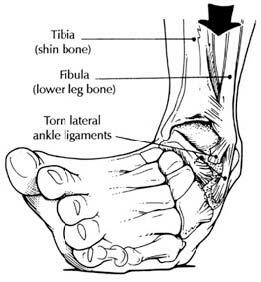 We treat lots of overuse injuries and injuries that are caused by improper foot wear. You do not have to be someone who suffers unnecessarily. Be sure that your shoes are appropriate for your activity, in this case jogging or running shoes. They should be in good condition, with appropriate support for your arches and enough padding to absorb the shock of your weight on the treadmill, asphalt, or ground. Make sure they are laced fully and tightly. Make sure you are fueling your body appropriately. You need the right kind of intake to keep your body performing at its best. Make sure that you are getting plenty of water, especially as the temperature climbs. Your body needs to hydrate to maintain itself. Don't forget that hydration isn't just for right after workouts but for before and during as well. You should constantly be taking in water to be healthy. The rule of thumb is 8 eight-ounce classes of water per day (or 64 ounces) for the average adult, but your water needs may vary. You will need to eat a balanced diet to see weight loss results, and also to feel your best while exercising. Eating a heavy meal before workouts is not usually the best idea. Work out before eating, as the food will help your body recover from your workouts. Remember that protein is necessary for your body to heal and build muscle, so make it part of your diet. If at any time during your workouts, you feel unusual, dizzy, or some kind of injury, do not think you can or should push through it. Your body has many ways of indicating to you when something is wrong, pain being one such way. You should expect some muscle soreness as your workouts progress and your body begins to improve. This is natural. But any sharp or major pain in your body is not a good sign. If you experience any major pain in or injury to your feet and ankles, do not hesitate to call us. We want to treat you so we can return you to your healthy new hobby. You can supplement this workout with other workouts. Low impact activities like biking, swimming, and using elliptical machines are a great way to relieve some of the stress on your joints. Supplement one of these activities for a half hour to an hour workout on days you are feeling especially sore or are looking for a way to vary and break up your workouts. Did you know working out will help you control your appetite? Try running an hour or two before a meal and see how it affects your appetite. For most people, you will see a reduction in your desire for food. You may still be hungry, but this will help prevent you from over-eating or making poor choices in which foods to eat. Making working out / regular exercise part of your life is one of the best things you can do for yourself. Once you can master a 30 minute jog, you really only need to exercise 3-4 days a week to maintain your conditioning and weight. Not only will you see improvements in weight and condition, but it will also improve many other important health markers, like cholesterol, blood pressure and insulin response. You can also try new activities and sports in place of a jog. Many games can be played with minimal equipment. 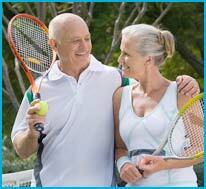 Popular sports for active people include biking, swimming, golf (try walking instead of driving a cart for an added workout), tennis, hiking, basketball, and softball. Need another suggestion? Try playing a round of Frisbee golf (also known as disc golf or sometimes "Frolf"). Riverbend Park has a course and it is right near Findlay! Weight lifting is also a popular way to workout. 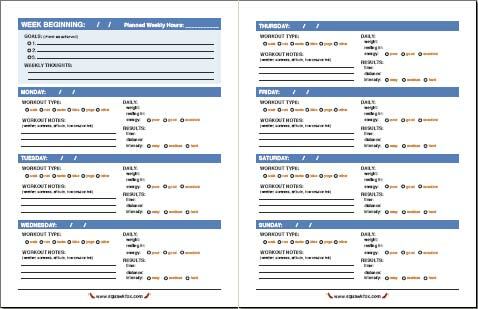 Scheduling workouts is smart! Many people will not work out regularly, and a common excuse is that they don't have the time. Scheduling an hour to workout and shower ensures that you will reserve some time for your half hour jog. If you enjoy working out, allow more time for this activity. 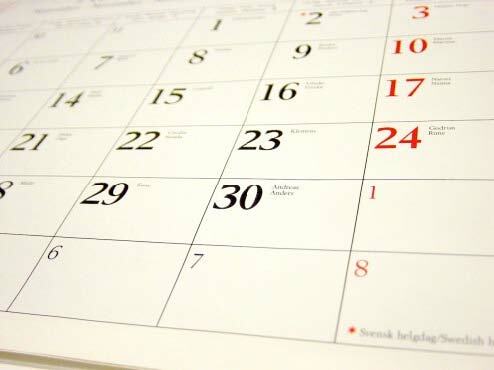 Put your workouts in your calendar, phone, PDA, computer, or however you track your time. Schedule your workouts based on your environment. This is actually something you will master more as time goes on. 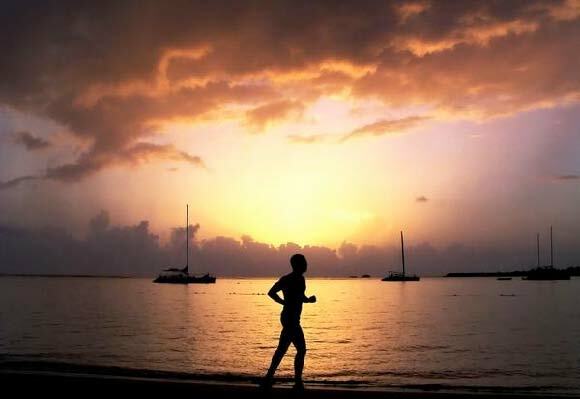 If you like to exercise in the summer, morning workouts are the best for avoiding the heat of the day. Wear sunscreen and sunglasses or a hat when it is sunny out to protect your skin and help relax your facial muscles as you run. Expect to run slower on very hot days and to require more water to re-hydrate, since you will sweat more. Early morning workouts are also the best time to run along streets or in cities as emissions from cars are at their lowest. If you like to exercise on trails in wooded areas, times with high sunlight are the best to avoid injuries caused by obstacles in your path. Remember that where you run affects how you run. A treadmill inside ensures you never have to fight the elements or miss your favorite television programs. 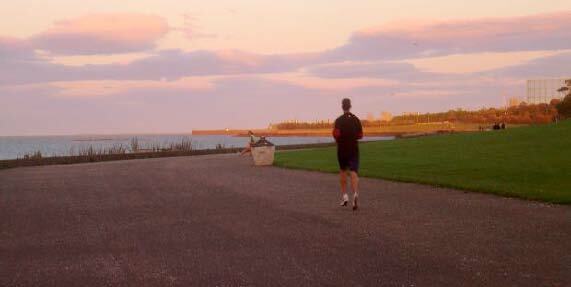 Running outside means you can enjoy more of your environment. However you chose to exercise, remember that consistency is good for your workouts. 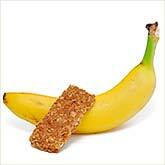 For solid workouts, trying fueling up by eating a piece of fruit or protein bar about 2 hours before your workout. Then about an hour before your workout, drink 8 ounces of a sports drink. This will help make sure you are properly hydrated and have sufficient nutrients (like sodium and potassium) for a good workout. Utilize a 2-3 minute walk before and after your workout as a warm up and cool down period (do not count this in the total time of your workout). Stretching before exercise isn't necessary but you may prefer to do so. Just be sure you are warmed up before jogging. You should stretch after your workout or in the evenings (maybe when enjoying your favorite television show) to help ward off sore and tight muscles. Stretching will go a long way to helping you workout with loose and comfortable muscles. Running is great for your body and can build strong bones, but the appropriate amount of calcium is necessary too. You should intake 1000mg daily or 1500mg daily if you are over 50. Try adding a 1-2 glasses of low-fat milk (1% or 2% preferably to whole or vitamin D milk) or 1-2 servings of low-fat yogurt or cottage cheese to your diet. Leafy green vegetables also contain lots of calcium. Remember your vitamins. Multi-vitamins are a great way to ensure you are taking in the vitamins you may be missing in your diet. You should try to get most or all of these nutrients from your food, but when you cannot, multi-vitamins are an inexpensive and easy to take supplement. Frozen peas make great ice bags! If you experience joint or muscle soreness, try using frozen veggies or an ice pack to help relieve pain and soothe sore joints. Best of all, they go right back in the freezer to be re-used later or for dinner. What you wear is important. How you look is not. Buying expensive training clothes is completely optional. Many people like the performance fabrics available to them. But you can easily run in the appropriate shoes with absorbent, cotton socks (make sure that your socks help prevent any blisters or abrasions on the back of your heels by wearing crew or ankle length and not no-show socks), athletic shorts (cotton or synthetic materials), and a tee shirt. On cold days, add sweat pants, sweatshirts, gloves and a hat. The more you sweat, the more evaporation will occur near your skin and make you cold. Be mindful of your body temperature on cold days. Also, if you are going to run in low light, be sure to wear bright colored or light clothing. 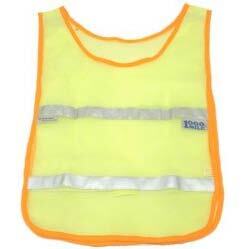 You may also want to invest in a reflective vest for over your clothes. Make your workouts fun. If you want to have a conversation partner, find someone else with a similar schedule who wants to get in shape. If you like listening to music, take your favorite mp3 player or radio with you. 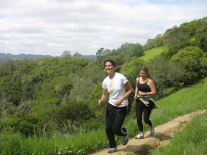 If nature hikes or runs make you happy to be exercising, find a park or forest to run in. Anything you can do to encourage yourself to exercise will keep you motivated and consistent with your workouts. Track your progress. Keeping track of your workouts, diet, and even your feelings/mindset about your exercise and diet habits will help you determine how you are doing. When you are able to look back on the progress you have made you will be encouraged to continue. You will also learn how you react to dieting or certain workouts. The better you know yourself, the better you will be able to continue your workouts in a consistent manner and anticipate/avoid pitfalls. Good Luck with your diet and exercise program. We hope that these tips and our 8 Week Run-Training program help you succeed in your exercise and health goals. We understand that getting back into shape can be a challenge and we wish you the best of luck. If you experience any foot or ankle injuries or pain, please don't hesitate to contact our office. We are here to help you find relief and get you back into your active lifestyle as soon as possible!